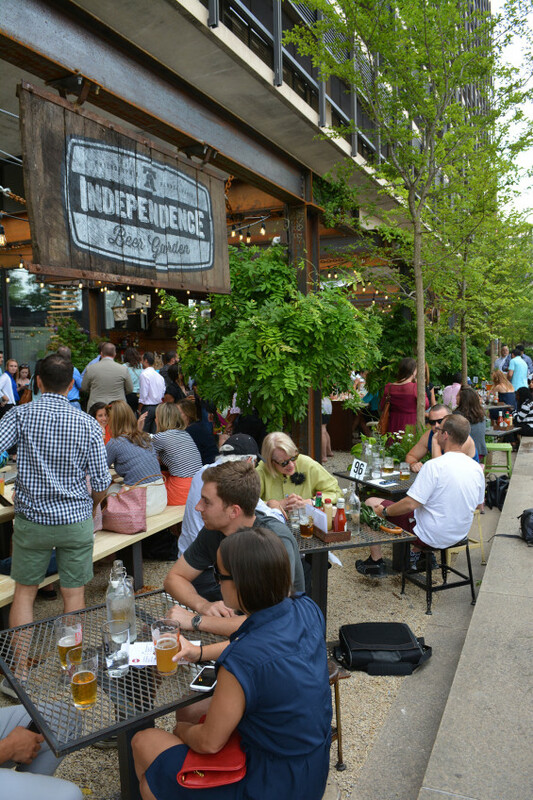 Philadelphia’s hottest open air restaurant, the Independence Beer Garden (IBG) is located in the heart of historic Philadelphia. 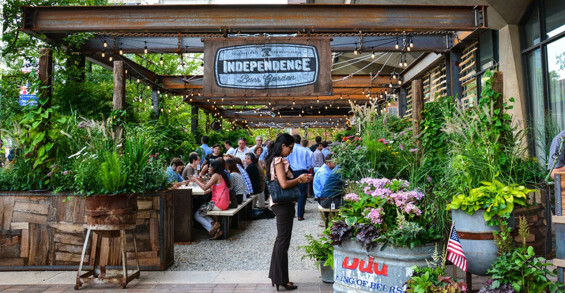 Spearheaded by Groundswell Design Group and Philadelphia’s own restaurateur, Michael Schulson, IBG pushed the boundaries of urban revitalization. 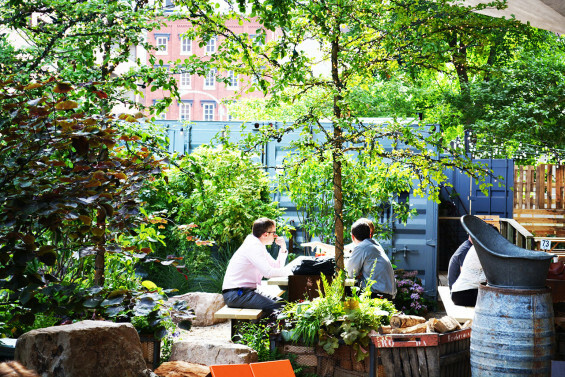 Groundswell’s ability to reinvigorate underutilized space is showcased with this 20,000 sq ft beer garden. Positioned in the expansive open space surrounding the DOW Chemical office building, a historic example of modern 1960’s architecture, the American style beer garden complements the existing architectural aesthetic while providing a contemporary vibe. Groundswell, true to its signature style, repurposed industrial objects and materials in ways that celebrate and accent the modernist structure designed by Pietro Belluschi in 1964. 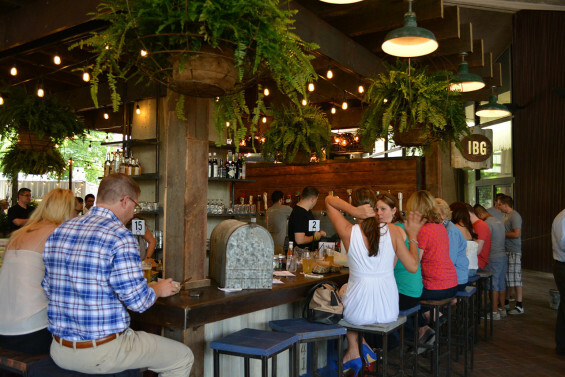 The rustic design of IBG, infused with reclaimed timber, distressed metals, and custom I-beam picnic tables provide the perfect vantage point for admiring the remarkable torqueing columns and faceted ceiling in the open air passage. Unintimidated by the obscure plaza, Groundswell was determined to take advantage of its entirety- creating a 360 degree design that wraps around the exterior of the DOW building and winds through the open air passage. Envisioning a space that would accommodate over 300 diners, yet still feel intimate, Groundswell created distinct moments that provide a variety of unique experiences. The main bar located in the breezeway of the Dow’s ground level offers visitors a place to escape the hot summer sun and enjoy the 40 craft beers on tap. 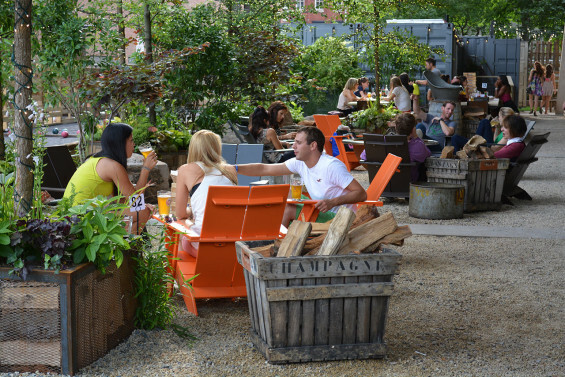 Set among the sensuous geometry and sizeable concrete columns, the beer garden features heavy industrial I-beams and reclaimed wood as well as a 10 foot projection screen. 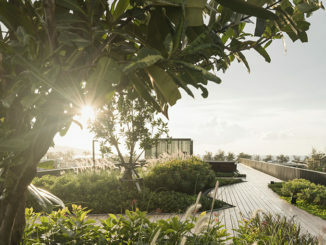 Behind the breezeway is a lively game area that offers entertainment such as ping pong, giant Jenga, shuffleboard and corn hole for guests to enjoy. Along the east side of the building a large I-beam pergola defines the space. Accented with climbing wisteria vines, chunky hardware, chains, and vintage pulleys, the rustic pergola complements the DOW’s concrete aesthetic. 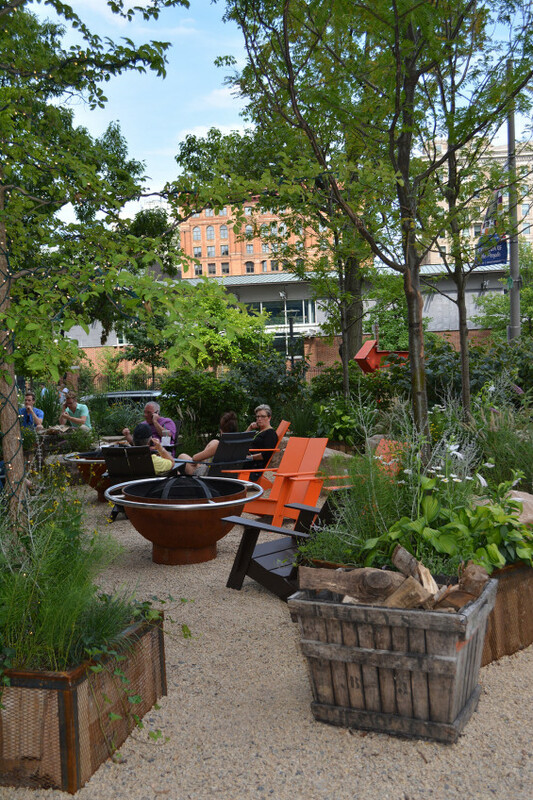 Lush native perennials and grasses surround the seating area while six large American Elms (Ulmus americana) provide dappled shade for those gathered at the custom beer garden community tables. 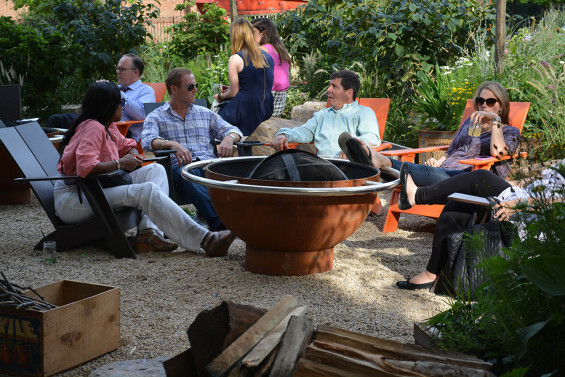 Around the corner, casual seating in the form of large granite boulders and bright orange Adirondack chairs gather around corten fire pits. Flanking the casual seating area is a raised linear planting bed that Groundswell transformed into two backyard bocce courts. Nine robust Honey Locust trees (Gleditsia triacanthos) illuminated with led mini lights help to soften the gritty nature of the space and create an inviting atmosphere. A total of nine salvaged shipping containers have been repurposed as restrooms, the kitchen, storage and a small event space. 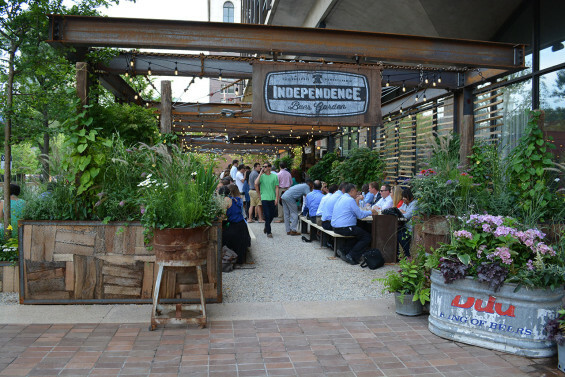 IBG has brewed a revolution of sorts in Philadelphia – it has surpassed expectations and succeeded in revitalizing the underutilized space surrounding the DOW building. 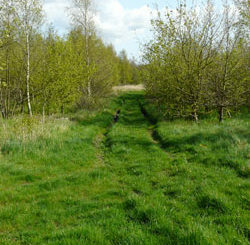 It encourages locals to to stay past their workday, converse with colleagues, and relax.